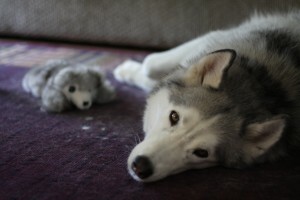 Veya with her "puppy" a couple weeks ago. Today the Veterinarian sadly diagnosed Veya with Immune-Mediated Hemolytic Anemia (IMHA). You can read more about the disease here. In short, it’s among the most common hematologic disorders among adult dogs. It’s characterized by rapid-onset anemia, weakness, loss of appetite, discolored urine, and jaundice. Essentially, Veya’s immune system has begun attacking and destroying her red blood cells faster than her bone marrow can replace them. The percentage of her blood consisting of red blood cells should be 43-59; hers was 29 on Saturday, and 15 today. Without enough red blood cells, her organs will soon fail due to lack of oxygen in the blood. Her heart rate and respiration rate have gone sky-high in their attempt to increase the oxygen in her bloodstream. Her body is literally fighting against itself. On the positive side, her bone marrow is churning out new red blood cells at a healthy and high rate in response to what’s going on. Research indicates that this is a very important criteria for a favorable prognosis. And, the ultrasound found no tumors, as the prevalence of lymphoma is high with this disorder, and even a possible cause of it. Treatment began immediately with a very high-dose course of steroids (Prednisolone), and other supporting medications. We’ll follow-up with another blood test on Thursday to see how she’s doing. The two-thirds of dogs with IMHA who do survive and recover from this disease have shown significant improvement within the first 1-3 days of treatment, so that’s what we’ll be hoping for on Thursday. About a third of affected dogs have a poor prognosis for recovery. This is a serious, life-threatening disease that came out of nowhere. We’re devastated, confused, sad, overwhelmed, and terrified that we might lose her. We’re also having to balance treatment options with what we can afford financially…a morally difficult position to be in, to say the least. We’re doing everything we can at this point, but if the steroid treatment doesn’t work, I don’t know if we’ll be able to afford a blood transfusion…OR, if Veya will even respond well to that. Your prayers and well-wishes are much appreciated.